GlassWorks offers a full range of Glass Tabletops and Table Bases. We will customize your Glass Tabletop or Table Base to your exact specifications. 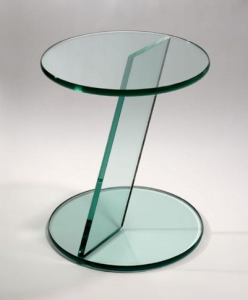 We start by choosing the ideal Glass thickness for the Tabletop or Table Base. We recommend 1/4”, 3/8”, or 1/2” thickness for your Tabletop or Table Base. We then further customize your Tabletop or Table Base with a variety of glass types and edges. Glass types offered include the popular shattered, starphire or “low iron,” satin etched, bronze and gray glass, backpainted, and acid etched. Edge types include beveled, ogee, pencil and chip. No matter what type of Glass Tabletop or Table Base you’re looking for, GlassWorks has the experience, training, and selection to make your dream Glass Tabletop or Table Base a reality!